It Ends Today, Inc, a New Jersey-based non-profit that aims to spread awareness of the problems bullying causes, is kicking off 2013 with a holiday party on January 6, 2013, followed by a Volunteer Appreciation Event on Feb 10. Both events will be held at 331 West 51st Street 2nd Floor New York, NY. It Ends Today is a member of the UCommunity, UPrinting.com’s non-profit sponsorship program. To spread its anti-bullying message, It Ends Today visits schools, hosting programs with specific themes for students. Topics presented explain the different aspects of bullying, its consequences as well as practical methods to prevent it. It Ends Today relies on social media to help spread its message . For example, students are invited to post a video of themselves talking about “bullying” on YouTube, and then share the link to it by sending it to hr@itendstoday.org.All videos are posted on the It Ends Today website and the creator of the most inspiring video gets to win a $2,500 academic scholarship. 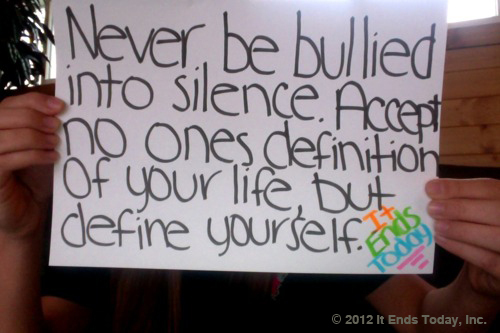 Bullying is unfortunately often seen as one of those things that every child will witness. Bullying can negatively affect kids for the rest of their lives – and it’s not just the direct victims of bullying either. Bullies often have underlying problems that they can’t express in other ways – they need help too.